What do you get when you put a naturalist and science writer with an illustrator who always reveals the shining light of all mother nature's creatures? 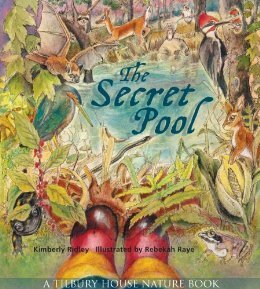 Throw in some interesting facts and empathetic energy and you get -- The Secret Pool by Kimberley Ridley and Rebekah Raye. From fairy shrimp to wood frogs, the wonders of ecology are abundant in vernal pools. For a budding 21st century ecologist, I couldn't imagine a more relevant and mysterious book to nurture their curiosity and inquiry. I'm now in love with every smiling critter in the vernal pool and armed with information that could help protect their crucial habitat. Every home with children and every science classroom would benefit greatly by adding this treasure to their book shelf. Brilliant topic to address with children and a validation to their natural tendencies to discover what is there in their world and to imagine what the eye can't see.